What is widely regarded in the card collecting community as the most valuable Pokemon card – the Pokemon Pikachu illustrator card, graded near-mint at PSA 9 – is for sale on eBay, with an asking price of $100 000. The sale ends on May 21st. The seller describes the card as “the T206 Honus Wagner of Pokemon” and “the Holy Grail of Pokemon” and points out that an ungraded copy of the card sold for more than $20 000, and a graded mint example is capable of earning more than double that. The seller, Scott Pratte, hopes the PSA 9 Mint grade will result in a six-figure payday. 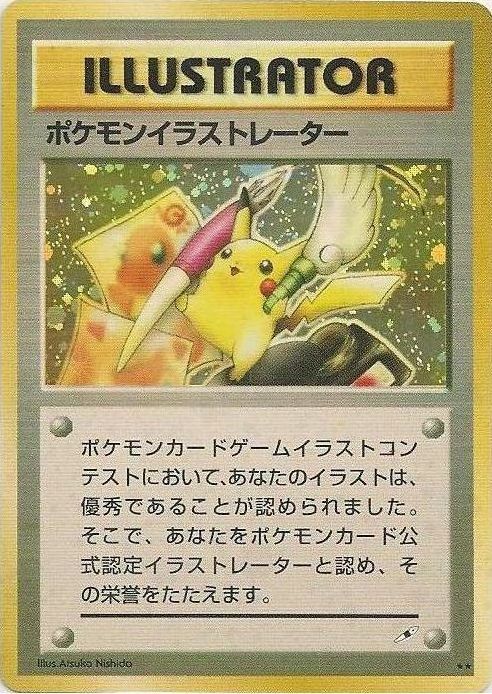 It is a promotional card, awarded to winners of the Pokemon card illustration contests that were held in Japan in the 1990s. Only a handful of this card was ever distributed. Its rarity, combined with the fact that it isn't even a trading game card but a promotional item, explains the asking price. Pratte actually posted for sale another one of this exact same Pokemon illustrator cards in 2013, also on eBay and with an asking price of $100 000. No word as to whether he got that, but one thing is certain: both cards are legit. Pratte enjoys 100% positive feedback across 3,409 eBay reviews. 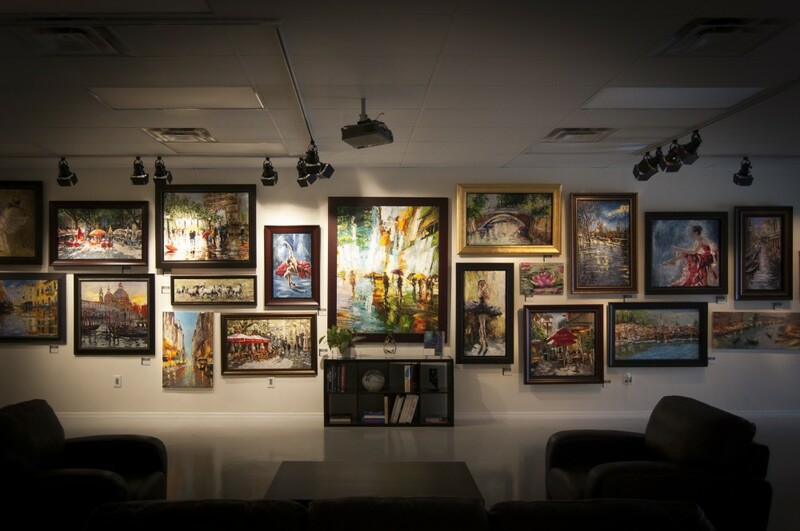 Every year, Baterbys Art Gallery in Winter Park, Florida holds an Art Gallery Event, one that features an auction packed with many of the most renowned names in the world of fine art, for a live-only audience (no internet bidding). This year's event is slated for Saturday, May 14, with an auction preview and pre-sale set to begin at 4 pm Eastern time. A portion of the proceeds will go to benefit The Assistance Fund, a not-for-profit that offers financial assistance programs for people diagnosed with ailments ranging from breast cancer to melanoma to cystic fibrosis. This year's Art Gallery Event will showcase 800 works of fine and decorative art. The roster of artists includes Henri Matisse, Salvador Dali, Joan Miro, Pablo Picasso and Peter Max, plus notable contemporary artists such as Elena Bond, Duaiv, Thomas Kincaid and others. The works are a blend of originals paintings, limited-edition prints, lithographs and etchings. The festivities will be held at Baterbys' 7 000-square-foot gallery, which is adjacent to its 8 000-square-foot warehouse. The firm has over 1.7 million artworks in stock. For more info, see here. …that would make collectors feel compelled to spend tens of thousands of dollars – sometimes even hundreds of thousands of dollars – to own one? Well, for one thing they're rare. That helps. For another thing, they're beautiful. And, not only do they serve the purpose of keeping time, they're also way cool with the animation and figural depictions. Exhibit A is pictured here: it's a Chinese animated triple fusee bracket clock that's estimated to sell for – are you ready? – between $500 000 and $750 000 at Fontaine's Auction Gallery's next auction, planned for May 21. The clock's hourly mechanism activates swimming ducks and spinning glass rods resembling a waterfall. A cluster of glass rods forms another waterfall in the top of the large-size gilt bronze case. So how cool is that? The clock also boasts a 6 ½ inch porcelain dial with black Roman numerals, and red jeweled Chinese characters that read “Da Ji” (Great Prosperity). It stands 36 ½ inches tall and is easily the expected top lot of the 500-lot auction. The expected second top lot? 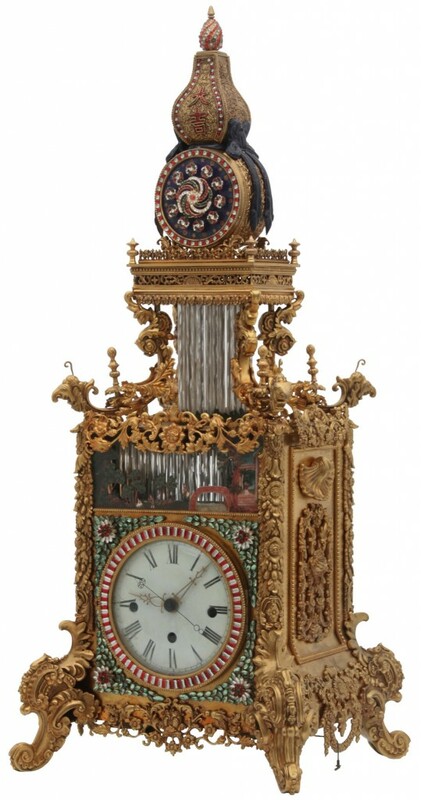 Another Chinese triple fusee animated bracket clock, estimated at a more earthly $50 000-$100 000. Does the name Cilla Black ring a bell? Fans of the Beatles may remember Ms. Black as one of England's favorite pop stars from the swingin' '60s, discovered by Brian Epstein, who also managed the Beatles. Black and the Beatles palled around a lot back then, and John Lennon and Paul McCartney even wrote songs for her. It was Epstein who first introduced her to the world art, and now three works previously owned by the late singer (she died on August 1, 2015 after a fall in her villa in Spain) will come up for bid at Sotheby's in London on June 13. All three paintings are by L.S. 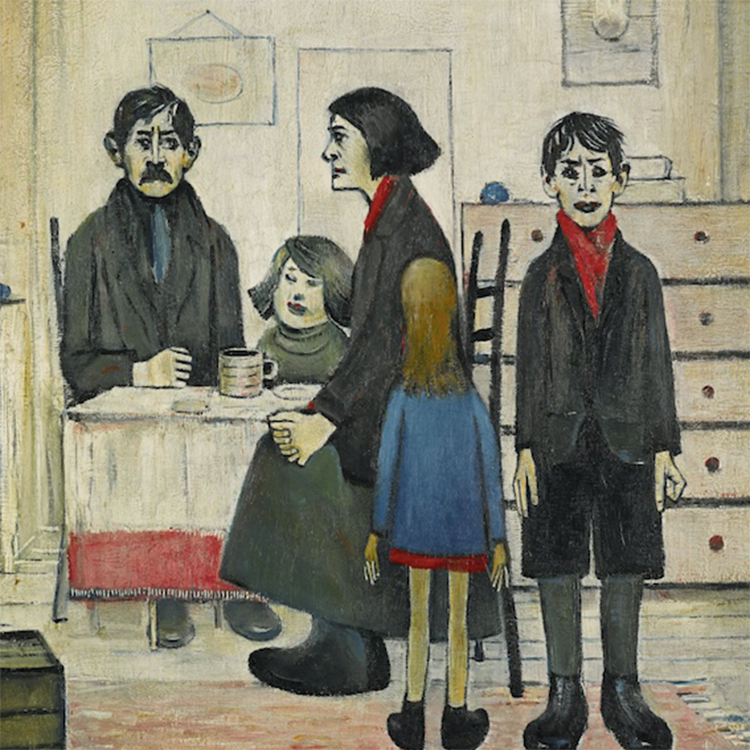 Lowry (1887-1976), one of Britain's best-loved artists. They have a combined estimated value of between $1 million and $2 million. 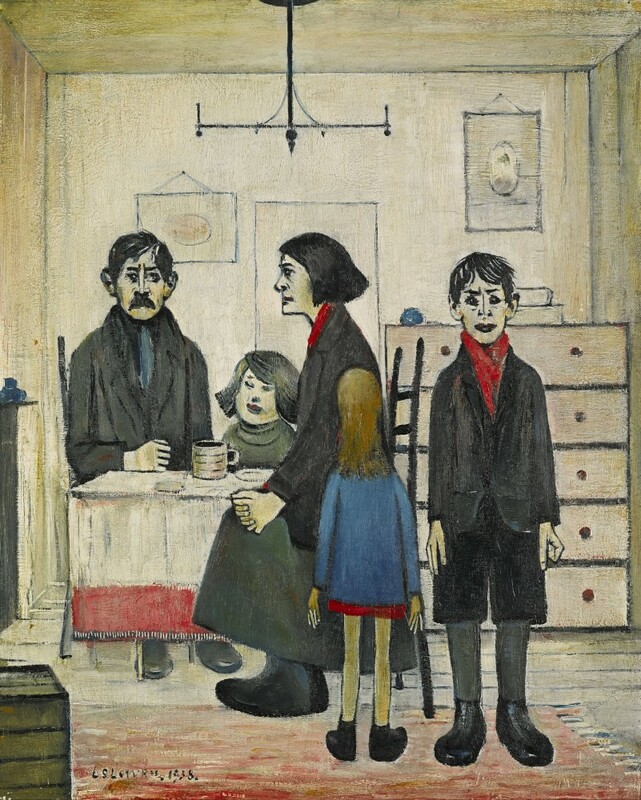 Cilla Black (and her parents) bought the kind of artwork they loved and could relate to, and Lowry was the painter of the very world in which Cilla grew up: the tightly packed terraces and backstreets of the cities of England's industrial north. The paintings depict day-to-day life, and Black hung them in her parents' home, “in the living room, where we spent the most time together,” she said. A rare and important autograph manuscript by Sir Isaac Newton – widely regarded as the most influential physicist and mathematician of all time – will be sold at auction on June 2nd by PBA Galleries in San Francisco. 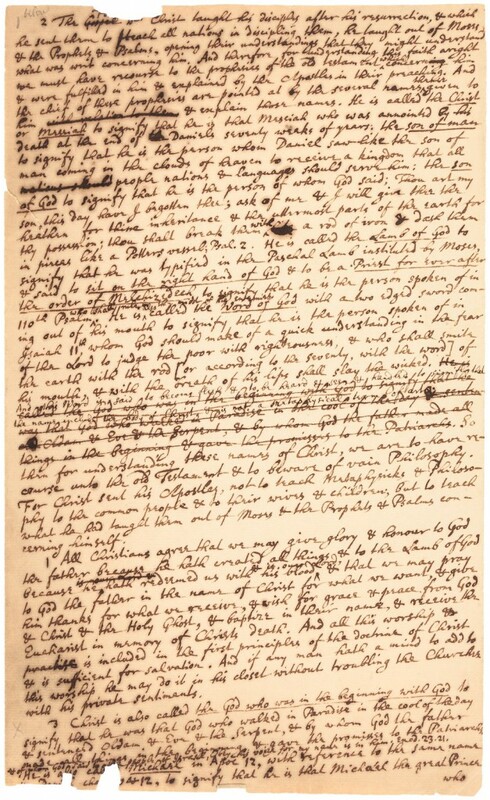 The thousand-word manuscript, penned by Newton around 1690, declares Newton’s personal religious beliefs and the fundamental principles of Christian faith. His views of theology, not often shared by Newton, were a key part of the overall world view that sustained his ground-breaking theories on the laws of motion and universal gravitation. The manuscript testifies both to the depth of the great natural philosopher’s religious beliefs and to his Biblical scholarship. It is from the Protestant Papers, a collection of scientific and non-scientific papers donated by the Fifth Earl of Portsmouth to Cambridge University in England in 1872. The bulk of the collection was auctioned off at Sotheby's in the summer of 1936. Newton manuscripts are rarely seen in private hands. Most reside in institutional collections. An official at PBA Galleries said she expected this manuscript would sell for between $80 000 and $120 000.